I wrote my first novel during my then 2-year-old’s afternoon naps in my tiny living room in Brooklyn, NY. Writing it was a fever dream & I was consumed. I poured everything I could muster into it. But I learned a lot writing that book over and over. I got close to signing with agents and met many of my core writing community during that time. I also learned how to let something go when the time was right. I used the only guide I had as an early writer: the books I was falling in love with. I copied Suzanne Collins and Veronica Roth, Maggie Stiefvater and Leigh Bardugo. I spent way too long revising. Like three years. I obsessed. I didn’t want to give it up. I wrote another YA fantasy, & it was better because I was a much stronger writer then. I landed an agent & I went out on sub. I wanted the sale, and it never came. It was time to go back to the drawing board again. I also kept writing screenplays. Then, thanks to a real life fangirl experience, I fell in love with Comic Con. I became deeply fascinated, rooted, to what it meant to be a fan. I wrote a screenplay set at Comic Con that was about grief & isolation & being alive. I ended up submitting that script to Austin Film Fest & placing in the second round of the competition. I decided to write it as a book. I’d never written anything contemporary before, or this personal, or this truly, deeply completely ME. It was exhilarating. During the writing of that book, we decided to move to LA, and then I decided to part ways with my agent. To go back into the query trenches was terror inducing, but staying where I was no longer felt right. I began querying again in January 2017. I had a 100% request rate. It was a roller coaster of feels. And then it was nothing. After few reluctant passes, mostly silence, I felt powerless, & confused, & I was not doing great with it. I started writing a book with my writing partner. For six months, we wrote ELLIE IS COOL NOW on Wattpad & I worked on a solo book in the background. Then ELLIE took off. We were nominated for the Watty Awards, and won! It was freeing, and empowering. January 2nd, 2019 I decided to query five more agents. I decided that would be it. Whatever happened, it was well with my soul. I searched MSWL on Twitter, & that’s when I saw Devin Ross. I had a punch in my gut that I should to query her. And then she requested. Then she emailed me less than a week later in the middle of the night to set up a call. I ran around the house. I punched the air. (& maybe my husband a few times from excitement. She offered to represent me. She loved this thing I loved and wanted to work on it – wanted to work with me. It was exactly where I was supposed to be, a whole year later than I expected. The journey we take as writers is a lot like the journey we take as people. We think we have a path we’re on, & that we know where it’s leading, what it will look like. We even think we know what we want. Then we learn: we don’t know, not a lick. Your journey may be different. It might seem easy for me to say “Never give up” because so far that’s worked well for me. But it isn’t. There’s nothing easy about looking back. At any point I could have stopped – I DID stop even – & I might never have gotten back up. Now I have to believe that book will sell (and sure, another will if not that one but that’s not the point) – I have to believe somewhere very near is my next yes, and somewhere out there is yours. April 30, 2014 .Reading time 4 minutes. 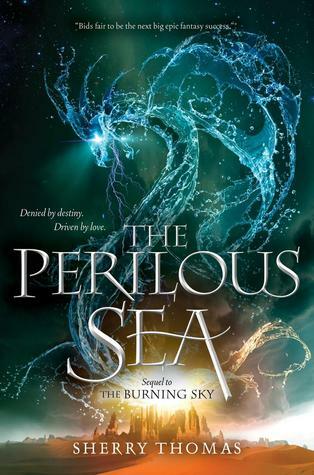 Still reading my ARC of The Perilous Sea by Sherry Thomas. I’m about 200 pages in and I think I may love it more than The Burning Sky. Plus, look at the pretty cover. I haven’t had as much time for reading this week because of my writing news. On Monday morning I received a revise and resubmit for my manuscript Redhunt. I was floored, if a little shocked. It’s with an agent I’m really excited to work with, and the notes were things I could see how to revise, and could see how they ultimately would strengthen the manuscript. I had come to a point with this book where I wondered — especially after finishing my new MS — should I move on? No, I hadn’t been querying it all that long, and really I hadn’t even queried all that widely. I had received multiple partial and full requests, but so far none had turned into an offer. This is exciting not only because it is a fantastic opportunity to work with an agent, but a chance to give this book one more go through, one more reinvigoration, and see what happens. I am willing to do whatever is necessary to tell this story right. The MS I am revising. My main character, Olie, is a hard voice to live with. She pushes at me, she makes me ache, she makes me angry, and she never does as she is told which is incredibly frustrating. I also know her so well that writing her is like breathing. I never question her voice, I just go with it. Being with her again (please, do not commit me, I promise I am sane) is a complicated thing, but a good one. Having an agent get your book on this level is, easily, the biggest confidence boost ever. Mumford & Sons, because they are my main soundtrack when working in this manuscript and I am excited to get to listen to them again. While I was writing Of Blood and Promises, I had to ban Mumford & Sons from my playlist. Their music is so synonymous in my head with Redhunt, that it distracted me. I added a My Books page to this blog, because I have now written two novels. This felt like a milestone worth marking somehow. My brother and his wife dedicated their baby at church on Sunday, and so of course they wanted to have a crawfish boil. 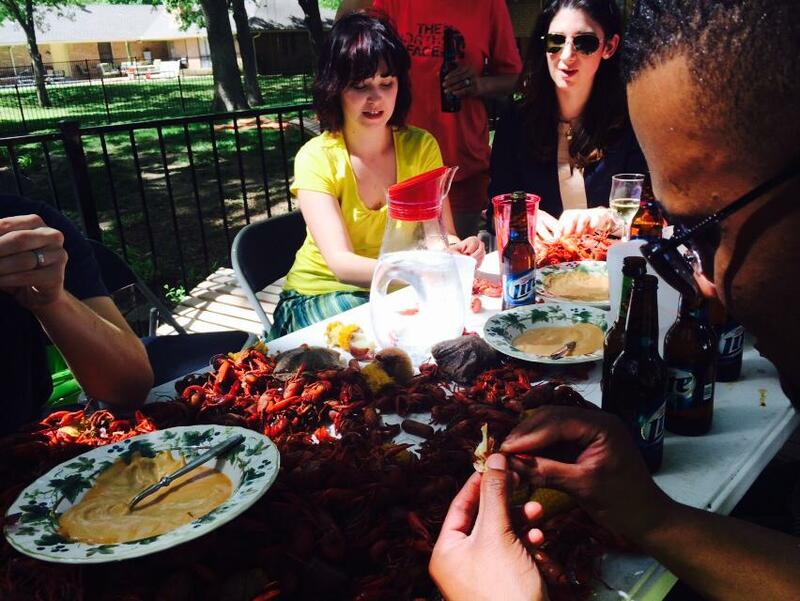 I had never been to a crawfish boil. It was an experience. I am a little squidgy about shellfish, but I am always determined to experience different cultures than my own with an open mind. I will say, the part of the boil I enjoyed the most wasn’t the tiny, muddy creatures, but the telling of stories around the table.